Journal Reference: Sedlacek A, T Onasch, L Nichman, E Lewis, P Davidovits, A Freedman, and L Williams. 2018. 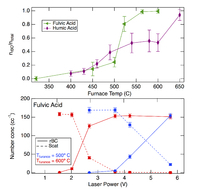 "Formation of refractory black carbon by SP2-induced charring of organic aerosol." Aerosol Science and Technology, , doi:10.1080/02786826.2018.1531107. 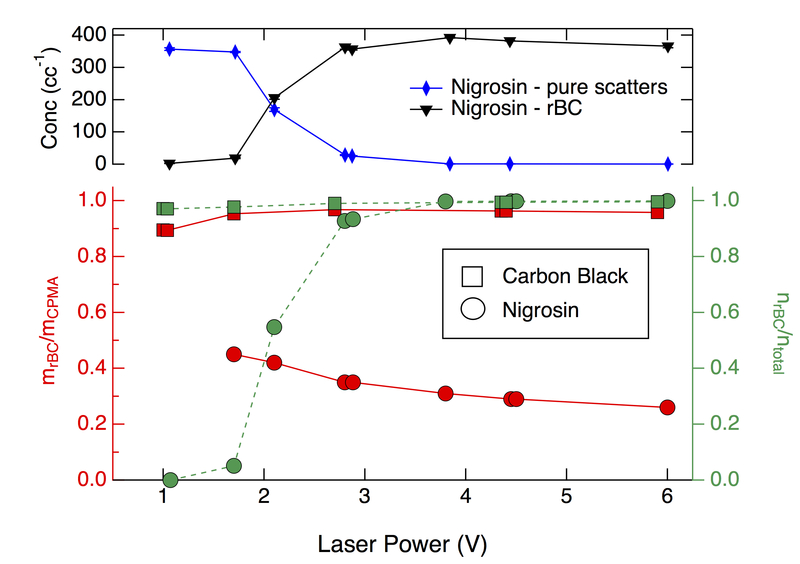 Upper panel: the number of detected rBC (downward triangles) and pure scattering (diamonds) particles as a function of SP2 laser power for nigrosin. Lower panel, left axis: ratio of SP2-derived rBC particle mass to original particle mass as a function of laser power for nigrosin (red circles) and carbon black (red squares); right axis: number fraction of BC particles to total number of particles for nigrosin (green circles) and carbon black (green squares) as a function of laser power. 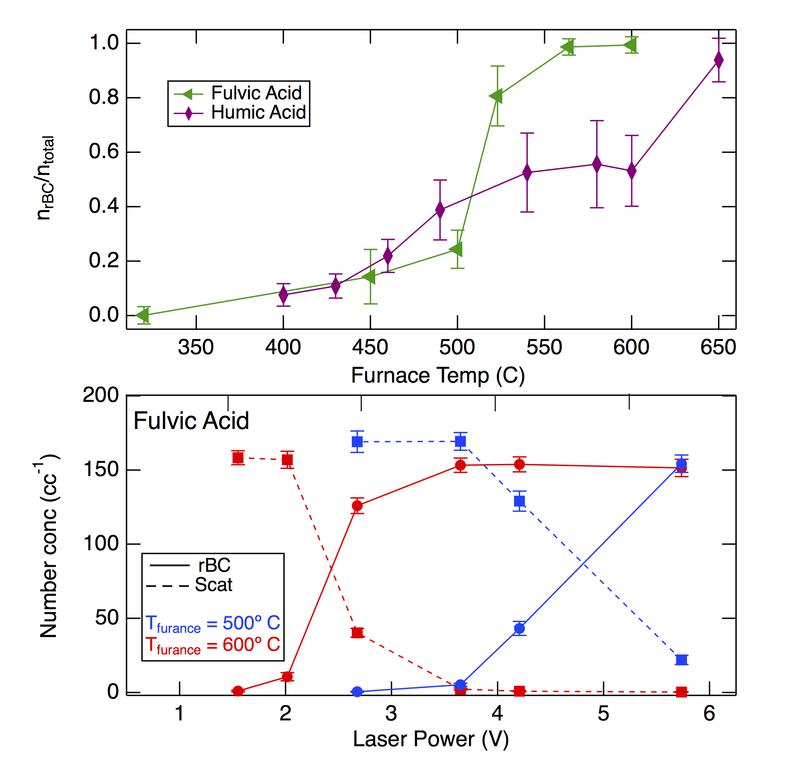 Upper panel: the ratio of the number fraction of rBC particles to total number of particles detected by the SP2 for fulvic and humic acids as a function of tube furnace temperature at a SP2 laser power of 4.3 V. Lower panel: number concentration of rBC and scattering fulvic acid particles at oven temperatures of 500 and 600 C as a function of the SP2 laser power. Similar behavior was observed for humic acid (not shown). Black carbon (BC) in the atmosphere continues to be a focus of research because its light-absorptive properties put it second only to CO2 as a warming agent of Earth’s climate. Towards this end, the measurement of ambient BC has been aided greatly by the development of the Single-Particle Soot Photometer (SP2) — an instrument that detects refractory black carbon (rBC) through laser-induced incandescence. Here, we report on the detection of rBC that is produced through SP2 laser-induced charring (i.e., carbonization) of organic aerosols. Failure to properly account for this heretofore unidentified artifact of the SP2 will lead to an overestimate of rBC loadings in emission plumes containing near-IR absorbing organic aerosols, like tar balls, which could, in turn, impact aerosol radiative forcing model predictions. We demonstrate that production of rBC can occur by charring of light-absorbing organic particles that did not originally contain rBC. This production of rBC has been observed for particle-containing substances that absorb at the SP2 laser wavelength (1064 nm) as a fundamental property of the substance (nigrosin), and for particles containing substances that are induced to absorb at the SP2 laser wavelength through thermally catalyzed chemical reactions such as may occur in a thermal denuder (fulvic acid and humic acid). Additionally, rBC was observed by the SP2 when sampling laboratory-generated tar balls — a type of carbonaceous particle that appears to be the nearly exclusive byproduct of some types of biofuel combustion/pyrolysis and wildfires — further expanding the relevance of this finding. This behavior could result in an overestimate of rBC, and thus misapportionment of BC and BrC, with implications for models attempting to simulate radiative forcing from biomass burning. Furthermore, the production of rBC from BrC could also be a factor in the BC/BrC correlations reported in the literature.